HThe Cambell-Stoke sunrecorder was invented by John Francis Cambell in 1853 and later modified in 1879 by Sir George Gabriel Stokes. It consists of a glass sphere where a paper sheet was placed in a distance from the sphere equal to its focal point. Because of its spherical construction, the sun produced a hot spot at the focal point and thereby burnt a trace in the paper sheet as seen on this sample with hour markers at the top and the burned marks at the bottom. In the more advanced versions different sheets were available to adapt for the seasonal changes of the suns azimuths and elevations. To register the sunshine hours was then a matter of measuring the length of the burned marks compared to the length of a given day. The great advantage of the Cambell-Stoke was its relatively simple construction and thereby also quite affordable price. The disadvantages were its inability to burn the marks just after sun rise and just before sunset due to the much lower intensity of the sun light even though the sky is totally clear. It was further a manual system where the operator had to collect the paper sheet and then do a more or less subjective judgment of the total amount of burn marks. Further the system was sensitive to ambient weather such as rain, icing etc. Irrespective of the disadvantages, the Cambell-Stoke sun recorder is still in use all over the world simply because no price comparable alternative has been available before. 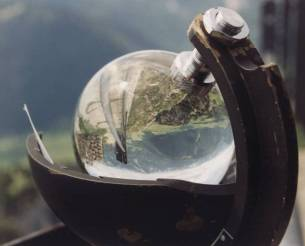 Today a much more expensive alternative is available and in use by several governmental meteorological organizations – namely the pyranometer which in simple terms is based upon the difference in solar heating of black and white elements. The Blake-Larsen sun recorder is based upon simple light measurement and sophisticated software, which makes the decision on whether the sun is shining or not. It has the capability to register sun shine correctly even just after sun rise and until the sun sets if the sun is clear and not dimmed by haze, light clouds etc. The system does fully automatically register the total hours of sunshine per day irrespective of the season and geographical location – of course provided the unit has an unobstructed view to the horizon of where the sun rises and sets.